"If a flyover occurred at the Pentagon, it would have been unmistakable and lots of people would have reported it." 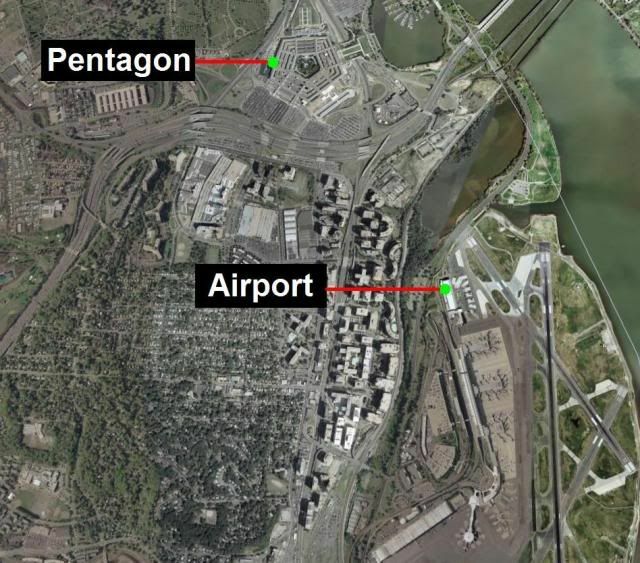 Reagan National Airport is one mile away from the Pentagon. There are low flying planes in the vicinity of the Pentagon every 2-3 minutes. This is an extremely regular occurrence. BBC Conspiracy Files program DEBUNKED. Following the BBC's pathetic attempt at debunking the 911 truth movement, there is a new documentary directly debunking the program's methods and impartitality - the bedrock of what the BBC was founded on. It is a slick, and highly impressive piece of filmmaking - and in my oppionion should be added to the front page, and also the recent media section - it really is that good!! It has David Shayler - ex MI5 agent doing the naration: but have no fear, there is not a single mention/hint of the NPT's. It methodically disects the BBC's Conspiracy Files program, using the latest 911 truth evidence, and arguments. It is tight all the way through, and literally HAMMERS the BBC to the ground. It is the best piece of counter debunking film yet found on the web (IMO). The mailman just knocked at my door, and was nice enough to deliver my copy of Dr. Griffin's latest book. I hope everyone purchases a copy, and promotes it as well.